Trump tweeted that there wasn't enough water to fight wildfires in California. Not long after President Donald Trump approved a disaster declaration for California as it fights multiple large wildfires, he blamed California's Democratic governor for what he said was a lack of water in the state. State fire officials and researchers said they do have enough water to combat the wildfires and that the unprecedented heat is the biggest contributing factor to why the fires are so destructive. "California wildfires are being magnified & made so much worse by the bad environmental laws which aren’t allowing massive amount of readily available water to be properly utilized. It is being diverted into the Pacific Ocean. Must also tree clear to stop fire spreading!" he tweeted Sunday night. California wildfires are being magnified & made so much worse by the bad environmental laws which aren’t allowing massive amount of readily available water to be properly utilized. It is being diverted into the Pacific Ocean. Must also tree clear to stop fire spreading! 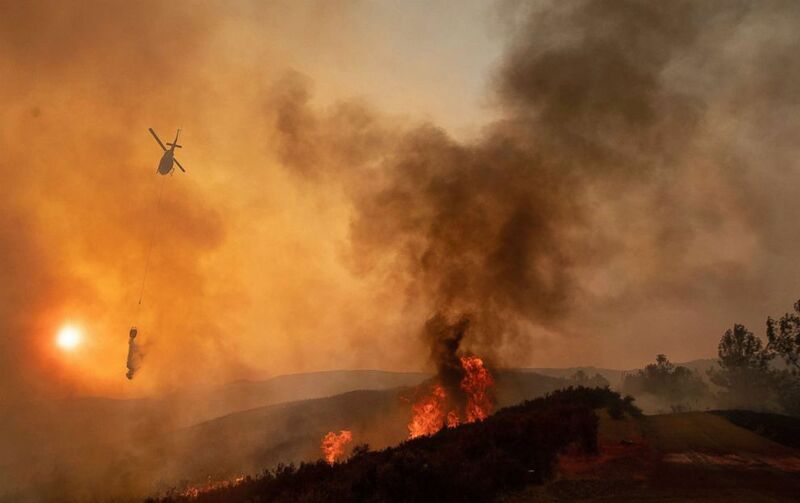 (Josh Edelson/AP) A helicopter drops water on a burning hillside during the Ranch Fire in Clearlake Oaks, Calif., Aug. 5, 2018. Interior Secretary Ryan Zinke also tweeted Monday that the state and federal governments need to take more action to remove dead trees from areas vulnerable to wildfires. Last year, Zinke directed managers on federal lands to take a more aggressive approach to remove brush and trees that could become fuel for wildfires, which environmentalists alleged was allowing clear-cutting to benefit the timber industry. Trump tweeted again Monday, specifically calling out California Gov. Jerry Brown for policies that he said took water away from fighting fires or farming. "Governor Jerry Brown must allow the Free Flow of the vast amounts of water coming from the North and foolishly being diverted into the Pacific Ocean. Can be used for fires, farming and everything else. Think of California with plenty of Water - Nice! Fast Federal govt. approvals." he tweeted. Governor Jerry Brown must allow the Free Flow of the vast amounts of water coming from the North and foolishly being diverted into the Pacific Ocean. Can be used for fires, farming and everything else. Think of California with plenty of Water - Nice! Fast Federal govt. approvals. Brown has repeatedly said that the state is fighting climate change with increasingly higher temperatures and more dangerous wildfires. In May he issued an order that would increase the number of trees removed to provide less fuel for wildfires. 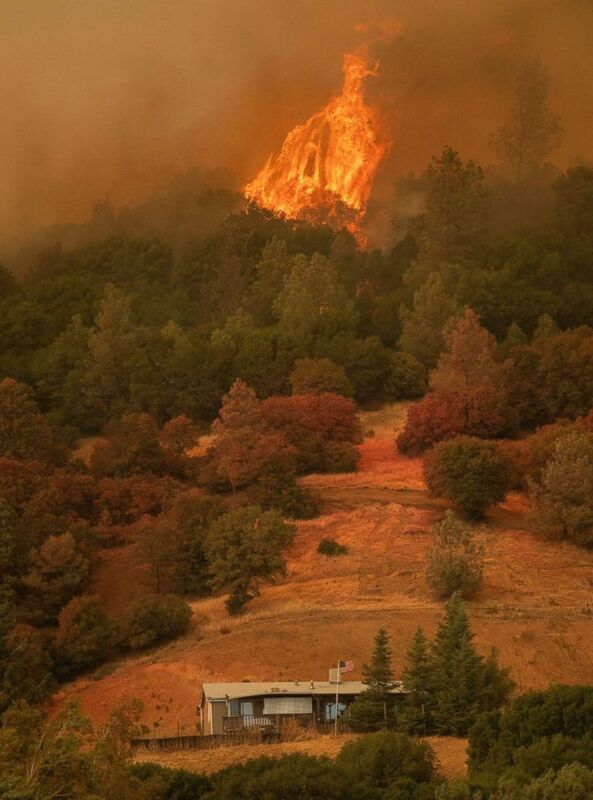 (Josh Edelson/AP) Towering flames approach a home during the Ranch Fire in Clearlake Oaks, Calif., Aug. 5, 2018. Los Angeles Times business columnist Michael Hiltzik wrote Monday that Trump's tweets misstate issues on climate change and water policy in California. Trump didn't include details on the policy he referenced in the tweets but Hiltzik wrote that there has been an ongoing political debate about water policy in California where agricultural businesses want water from rivers to be pumped to the area around their farms, even though state policy protects the water flow in the rivers because it is necessary to protect endangered fish and salmon. Wildfire officials in California said they have nothing specific to release in response to the tweet, but did say that Trump's statement claiming there isn't enough readily available water to fight the fires is not accurate. "We have plenty of water to fight these fires," Deputy Cal Fire Chief Scott McLean said in a statement. "The Carr fire has Whiskeytown Lake, Shasta Lake and Trinity Lake just to name a few water sources. The Mendocino Complex is next to Clearlake Lake. The current weather is causing more severe and destructive fires." Firefighters in California use multiple strategies to contain wildfires, including dropping water or fire suppressants from aircraft and using bulldozers and other tools to remove fuel from the path of the fire. Researchers took issue with the president's comments on Twitter, saying that he was likely referencing state laws that manage water in rivers to protect endangered fish populations. (Justin Sullivan/Getty Images) California Gov. 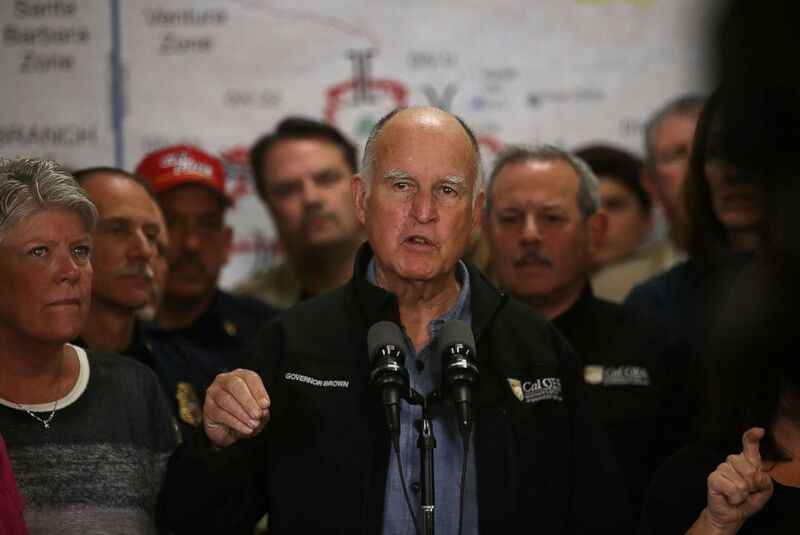 Jerry Brown (C) gives a briefing on the Thomas Fire and other Southern California wildfires during a news conference at the Ventura County Fairgrounds, Dec. 9, 2017 in Ventura, Calif.
A. LeRoy Westerling, a climate and wildfire researcher at the University of California - Merced, said the changes the president seems to suggest wouldn't compensate for water evaporation from warming temperatures and that clearing trees wouldn't help with fires that mostly use grass or other plants as fuel. ABC News' Jennifer Harrison contributed to this report.